When organizing your shelving at supermarkets, convienence stores, dollar stores, mass merchants, auto part stores etc., there are very good and complex shelf organizer product display systems that are very costly and not very easy to adapt and change out; then there are merchandising systems such as our thermo formed shelf dividers & organizers which will not break any budgets and are easily switched out and maintained.Increase your sales, affordably, with shelf separator dividers from Clip Strip Corp.
Keep in mind, when a shelf doesn't have any Shelf Dividers, your retail store customers have a harder time placing products back where they belong and this leads to others not always able to find what they are looking for. Your static price channel labels may not be below the right product, etc. Don't enable this type of confusion which leads to lost sales. And keep in mind, your staff must constantly fix this problem on your shelves and that labor time gets expensive. We are Point of Purchase industry leaders since 1979, count on Clip Strip for retail display materials and product merchandising fixtures. Call or contact us today with any questions or needs you have, we are here to help! To use ADHESIVE versions, clean the surface you are adhering to, make sure it's 100% dry, remove the peel and stick backer, align the shelf divider on the shelf considering the width of the product being placed on the shelf. Press down firmly on the sticky area so it adheres to the shelf and begin your product merchandising. 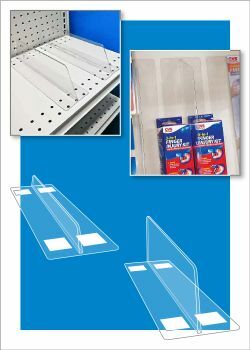 To move the plastic removeable, reusable shelf divider to another area of the store fixture, carefullly pull the divider away from the surface, slowly, without bending it and move it to the new location in the store. To use the MAGNETIC versions, just place shelf divider where you desire and you are done, repostion many times over, over many years of usage. 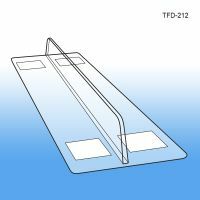 Minimum quantity for "Shelf Divider, 1" H x 12" L x 3" W, Thermo-Formed, Adhesive Mounting, TFD-212" is 25. 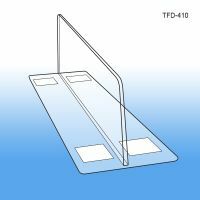 Minimum quantity for "Shelf Divider, 3" H x 10" L x 3" W, Thermo-Formed, Adhesive Mounting, TFD-410" is 25. 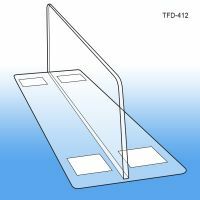 Minimum quantity for "Shelf Divider, 3" H x 12" L x 3" W, Thermo-Formed, Adhesive Mounting, TFD-412" is 25. 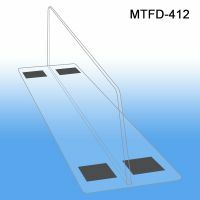 Minimum quantity for "Shelf Divider, 3" H x 12" L x 3" W, Thermo-Formed, Magnetic Mounting, MTFD-412" is 25. 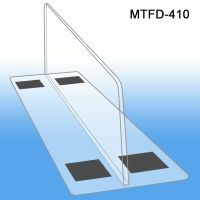 Minimum quantity for "Shelf Divider, 3" H x 10" L x 3" W, Thermo-Formed, Magnetic Mounting, MTFD-410" is 25. 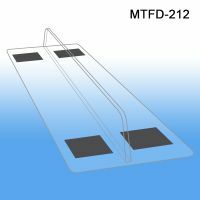 Minimum quantity for "Shelf Divider, 1" H x 12" L x 3" W, Thermo-Formed, Magnetic Mounting, MTFD-212" is 25.